change acre of aches into lots of leisure! No other tractor in its class is so gentle to drivers as the Broadmoor. It's soft seat flotation tires make riding truly soft - no head-snapping forward lunges either with its soft-action clutch when you move out in either the two forward speeds or the one reverse. 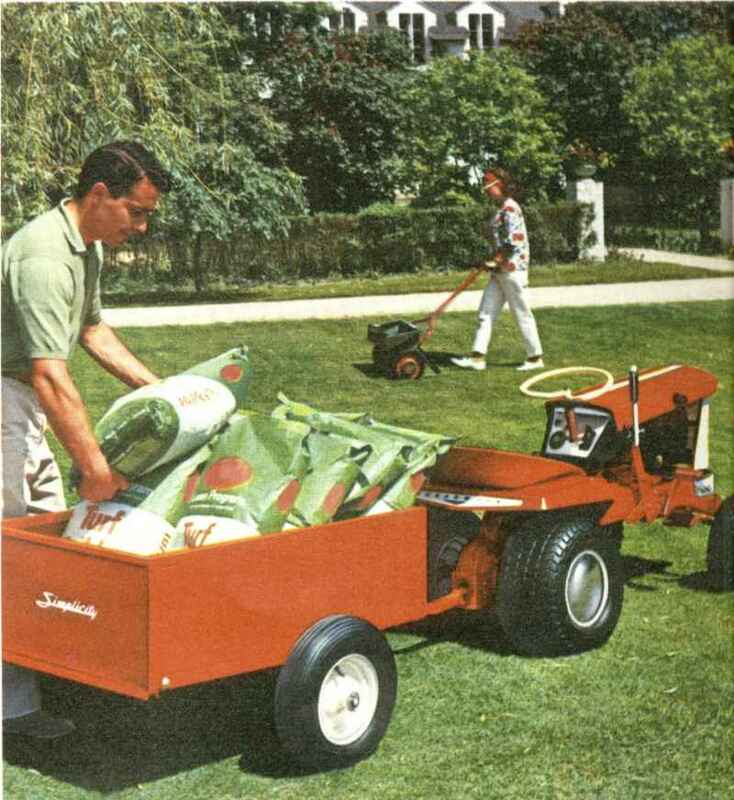 It's easy to boss the Broadmoor, too - its geared steering mechanism lets you circle small flower beds and shrubs in one pass, and get within a half-inch of trees and fences. Good-bye to tiresome jockeying and endless hand trimming! Here are some more features that let you sit pretty on a Broadmoor: A relaxing deluxe foam rubber bucket seat . . . especially designed blower system that forces engine heat forward and away, never back at you . . . handsome panel that puts all controls within easy reach . . . gas gauge that tells you exactly how much fuel is in the tank. Feature for feature, this Simplicity beauty is Suburb-Buy of the Year . . . the ideal combination of power, performance and versatility. Half-Ton Dump Cart (Mfg. No. 990085) This cart takes the carry out of yard work ” it hauls seed, fertilizer, heavy or bulky implements, and is great for dumping waste of all kinds. Sturdy heavy-gauge steel body and electrically welded steel frame are completely reinforced to haul heavy loads constantly for many years. Unit can be completely tipped without disconnecting the trailer hitch or lifting the trailer wheels from the ground. One-pin hitching and tail gate is detachable. Capacity: Half-ton, size 39 x 26 x 12. 36" Lawn Roller (Mfg. No. 990227) This roller more than covers the Broadmoor's wheel span, and makes your lawn carpet smooth. Unit attaches with just one pin, weighs 370 lbs. when filled with water, and has a spring-loaded scraper which cleans roller surface while in operation. Diameter: 18. Length: 36. Made of heavy 12 gauge steel. Electric Light Kit: (Mfg. No. 990334) Two 12-volt sealed beam lights. Electric Starter Kit: (Mfg. No. 990304) Includes 12-volt 40 amp automotive battery. 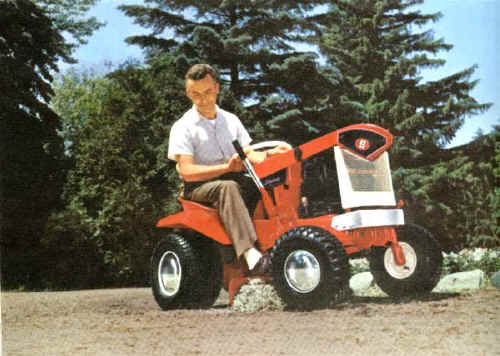 Rear Weight: Furnishes better traction for front-mounted attachments or other attachments needing maximum pull.(Mfg. No. 990300), Collar Weight (Mfg. No. 990045). Engine: Briggs & Stratton 6 hp, 4 cycle, single cylinder, vertical shaft, air cooled engine featuring Easy Spin Starting and equipped with large recoil starter, oil bath, air cleaner. Manual carburetor, throttle control. Remote choke control. Piston displacement: 14.1 cu. in. Bore and stroke, 2 ¼ x2 ¾. Clutch: Soft-Action belt clutch, with spring loaded idlers and special long-wearing belts. Transmission-Differential Combination: Specially designed 2-speed rear axle gives 2 forward speeds and one reverse. Geared differential for maximum durability. Pivoting frame allows front wheel to ride over an 8 obstacle. Tires: On Mfg. No. 288 and 303, soft pneumatic stud-tread standard 5.30 x 6 in front; extra-wide, low pressure Terra-Tires, 9.50 x 8LP, 2 ply, in back. On Mfg. No. 287, standard tires front 4.10 x 6, and rear 5.70 x 8.